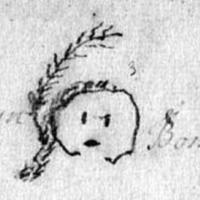 The signature of Abenaki sachem Bomoseen is one of many attached to the Portsmouth Peace Treaty of July 13, 1713. Some of these signatures are printed in spiraled cursive while others are elaborate totems, emblems used by Native American leaders to represent their tribe (1). Most totems on the treaty are recognizable figures like turtles, birds, or deer, but Bomoseen’s is not as easily discernible. 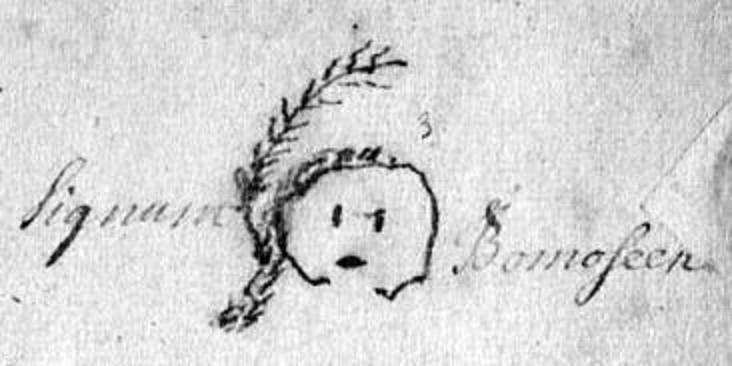 Some, like Mary Calvert, have speculated that “Bomoseen’s totem is a charming drawing of a girl’s head bringing to mind that he had a dearly loved daughter” (2). This claim can be argued however, mirroring the complicated and debatable legacy Bomoseen left behind. Known best for leading the attack on Oyster River Plantation in 1694, he was a man revered by his Abenaki tribesmen and loathed by the British. But to understand Bomoseen and his place in the Oyster River Massacre, one must look deep into history prior to the raid and the related Portsmouth Peace Treaty to see the conflicts that had driven the Abenaki’s to fight in a white man’s war. While the dates and numbers are true, this memorial promotes the one-sided history that has been passed down for generations, retelling the event as an unprovoked attack on a sleepy New England colony. What is often excluded in these accounts is the expansionist culture of the British settlers, who had begun invading Abenaki territory many years earlier. While the Abenaki people witnessed the land they once knew drastically altered by colonization, they took action to save their tribe from devastation by adapting to European war customs and forming an alliance with the French. As historian Craig Brown explains, “the Abenaki regarded themselves as a military power on equal footing with the Europeans. The Indians were fighting primarily to recover kinsmen taken by the English and to push back English encroachment on their land” (3). For years, Abenakis struggled to continue their way of life as the British pushed them off their land in Eastern New Hampshire and Southern Maine, blocking their fishing sites and damaging their corn crops with loose cattle. The Abenaki view of land rights can be seen through Bomoseen’s own words as reported to the Council of Massachusetts by John Hill: “all those lands belonged to his uncle Moxis the Chief Sachamor of that place, and [John Hill] saith that those Eastern Indians carry themselves very surly and insolently and do say, that the English shall not repossess and enjoy ye lands in ye province of Maine than by agreement with them” (4). The Abenaki realized that their best approach to dealing with these people was to follow European customs, including using treaties and agreements to come to compromises. Although Bomoseen’s request to respect Abenaki land should have come as a forewarning for future conflict to come, his words were often ignored by the British, who constantly “encroach[ed] on [Abenaki] territory creating much tension between the two peoples, which fed a continuing cycle of diplomatic negotiations and violent clashes” (4) including the Oyster River Massacre. During King William's War, fought from 1689 to 1697, French-Abenaki raids on British settlements were a common battle tactic. After the Treaty of Pemaquid was signed in 1693, outlining peace and trade conditions between the British and Abenaki, the French realized they had to keep their Abenaki allies on good terms if they wanted to win the war. Although thirteen Abenaki chiefs signed the document, "the English assumed that the signers of the treaty represented all the Indians, which reflected a dangerous lack of understanding of Indian politics and social structure" (3) Each smaller tribe had a chief, and any chief who did not sign the treaty did not feel like they had to listen to it. While some Abenaki clans agreed to these new acts of neutrality with the British, others remained loyal to the French. When the governor of New France, Louis de Bade Frontenac heard news of the Treaty of Pemaquid, he enlisted the French military and Abenaki allies to invade Oyster River Plantation, a small town some ten miles inland from the Atlantic Ocean. The French were led by Claude-Sebastian de Villieu and the Abenakis by Bomoseen. The 250 Frenchmen and Indians attacked Oyster River Plantation on July 18, 1694, killing 45 settlers, taking 49 captive, and burning 5 homes to the ground. Hezekiah Mills, an Indian who allied with the British testified his account of the raid, claiming he “saw Bomaseen in his canoe which was well-laden. There was four English captives, some scalps and a large pack of plunder brought in that canoe” (5). This is one of very few first-person testimonies of the Oyster River Massacre, corroborating Bomoseen’s commanding presence at the raid. Due in part to his leadership during the raid, it was determined a French and Abenaki success as the attack resulted in death, famine and destitution for British survivors. Almost twenty years later, the French admitted defeat against the British in the War of Spanish Succession, which carried over into the New World territories. On January 19, 1712, the French signed the Treaty of Utrecht, establishing peace between the two powers and shifting control in many European nations. With command of New England, the British called Abenaki leaders to Portsmouth in July of 1713 to sign the Peace Treaty of Portsmouth, outlining the new rules tribes must follow under British command. 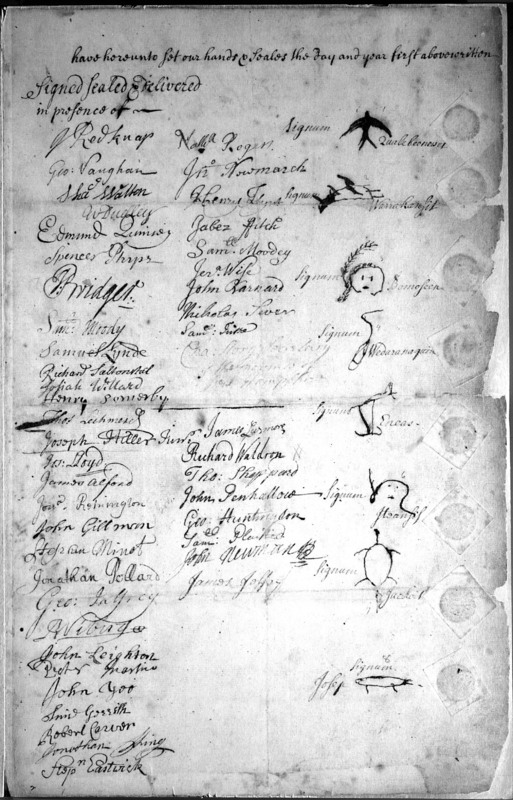 -Address grievances in English court, rather than in "private revenge"
The signatures of Bomoseen and other Abenaki tribal leaders on this document shows their acceptance to follow British customs in an attempt to conduct themselves as a respectable military power. Although their French allies had lost, the Abenaki were not willing to abandon their dignity and followed the treaty until the British broke their promises, encroaching on land they promised not to touch. Bomoseen remained loyal to his people while attempting to do what was best for them, whether during the Oyster River Massacre, the Peace Treaty of Portsmouth, or other events during the French and Indian War in later years. (1) Kidder, Frederic. The Abenaki Indians: Their Treaties of 1713 & 1717, and a Vocabulary. Portland: Brown Thurston, 1859. Page 25. (2) Calvert, Mary R. Black Robe on the Kennebec. Monmouth, 1991. (3) Brown, Craig J. "The Great Massacre of 1694': Understanding the Destruction of Oyster River Plantation." Historical New Hampshire 53 (1998): 69-91. (4) Belmessous, Saliha. Native Claims: Indigenous Laws Against Empire:1500-1920. New York: Oxford University Press, 2012. Page 108. (5) Farnsworth, Janice. "Testimony of Hezekiah Miles, Friendly Indian, on Preparations of Attack on Groton & Oyster River." Northeast Captivity Stories. 3 April 2012. 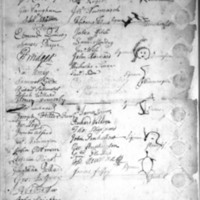 "Portsmouth Peace Treaty of 1713"
Levi Woodbury Papers, Library of Congress, Washington D.C.
Bomoseen (Bomazeen), “"Signature, Treaty of Portsmouth" (1713) by Bomoseen,” Indigenous New England Digital Collections, accessed April 23, 2019, http://dawnlandvoices.org/collections/items/show/266.